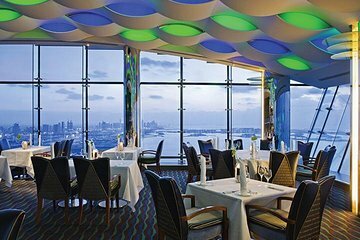 Take dining to new heights in Dubai with dinner at Burj al Arab’s Al Muntaha restaurant. The must-visit eatery sits on the luxury hotel’s 27th floor, facing the Arabian Gulf, and offers an international menu with signature dishes like seared wagyu beef. Savor your meal, and make use of a hotel pickup and drop-off service for a special meal out in Dubai. Je déconseille cette excursion Arnaque. The Burj Al Arab the 6 star hotel. One can only enter with a reservation. Dinner was good, the staff courteous and attentive. The food very good.